The following is an excerpt from an essay that first appeared in the American Orchid Society BULLETIN (what later became the current Orchids Magazine) in November 1981; the ninth in a many-part series on orchid growing for the beginner. At that time, the Society was headquartered at Harvard University, hence the references to the Cambridge offices. While much has changed in the intervening 28 years, including the society's headquarters, the general message remains the same. Some orchids such as Cattleya aclandiae have rambling growth habits and extensive aerial roots and are better suited to growing mounted on a slab or a stick. Healthy roots are absolutely essential to orchids. Without a substrate conducive to root establishment, growth and function, an orchid cannot absorb the nutrients and water it requires. What are the properties of a suitable growing medium? It should be firm and yet well aerated. Having these two characteristics, such a medium can offer a foundation to which the roots can attach themselves, while at the same time allowing the aeration necessary for their proper function. Quite a diversity of materials is suitable for orchid culture. The choices are limited by what is available (at reasonable cost, or with minor effort). Naturally enough, parts of trees and other plants, in the form of branches or plaques (cork or tree fern), come closest to duplicating conditions of epiphytic orchids in the wild. Once mounted and established, any number of epiphytic orchids, especially species, prefer the airy conditions and rapid drying tendencies of such surfaces. Pendent orchids, or those with rambling rhizomes, like the Bulbophyllum pictured here, allow the grower little alternative but to resort to mounting. A plant with lengthy rhizomes can leave its pot in no time flat! An increasing number of today's growers are "slabbing" many of their orchids with encouraging results. Even so, mounted orchids can pose a number of difficulties, particularly for the beginning indoor grower. These include plant establishment, positioning in a windowsill area or under lights, and watering. In addition, orchids attached to slabs are more likely to react adversely to the low humidity conditions often found indoors than those grown in pots. These words of caution aside, every orchidist with a diverse collection eventually comes across a plant which would profit from slabbing. For the benefit of these orchids, a grower should make use of this alternative medium. At the other end of the media spectrum, gravel culture for potted orchids has its share of advocates (see Arp, 1980). By using an inert, inorganic potting material, several problems inherent in using a more conventional, organic potting medium can be avoided. To begin with, competition for nitrogen by the decay organisms usually found in woody media is all but eliminated (see the previous article for this series: Orchid Culture - 8 - Fertilizing, October 1981 BULLETIN, pages 1207-1212). Secondly, because these inert materials do not decay, as potting media they remain porous and intact indefinitely, unlike woody media which typically break down into a fine, relatively airless humus. In this way, the risk of root decay resulting from anaerobic conditions is considerably lessened. Inorganic potting media — synthetic or naturally occurring gravels, and the like — are also reusable, after sterilization. Nevertheless, it should be mentioned that inorganic growing media have had only limited use with orchids, as of yet. [Editor's note: Since this was originally written, much experimentation has occurred with these various inorganic media and, in fact, they are now a very common, attractive, alternative in areas of high rainfall and humidity.] Rapid drying can be a problem, and fertilizing is perhaps more crucial due to their inorganic nature. There are reports in the literature of success with epiphytic orchids in inorganic media, but for orchids with higher water requirements, such as those with terrestrial leanings, the results have been mixed. A selection of orchid potting media. Clockwise from one-o-clock: tree fern, lava rock, Aliflor,sphagnum moss, osmunda, rockwool and fir bark in the center. By far the growing medium most commonly used for orchids is a mixture of organic, and frequently synthetic, materials. Gone are the days when osmunda fiber was used almost to the exclusion of every other possible medium. With the inevitable scarcity and high price of osmunda came experimentation with, and eventual use of, other more available alternatives, principally fir bark and, to a lesser extent, tree fern. These are occasionally used as the sole ingredient of a potting medium, but are more commonly mixed with other materials: peat moss, perlite, etc. When fir bark first came on the orchid scene in the late 50's and early 60's, it was in ample supply. Once it was understood that orchids grown in bark needed a higher-nitrogen fertilizer(Editor's note: This assertion is now not nearly as well supported as it used to be. High nitrogen fertilizers contain urea, a nitrogen source no readily available to plants without intervention by soil organisms. The conversion of urea to usefull forms of nitrogen is strongly temperature dependent and also results in the liberation of significant amounts of acid into the medium. Organic media such as fir bark has a fair capacity to buffer this acid release but inorganic media like aliflor or gravel do not and as a result, high nitrogen fertilizers may actually not be the best choice. ), fir bark was well accepted as a good substitute for osmunda. Certainly, it was easier to pot with! Fir bark is marketed by grades. Fine-grade bark, composed of small pieces which tend to make a more water-retentive mix, is generally used for seedlings and some moisture-demanding terrestrials. Medium-grade bark, containing intermediate-size chips, is the typical major constituent of mixes used for the orchid of average size and watering needs. Lastly, coarse-grade bark, with its relatively large chunks, creates a very porous medium more subject to quick drying, even in a large, specimen-size container. It is frequently used for large specimen plants, and for those which prefer a very open, rapidly drying mix. Fir bark, because it is woody, tends to resist water at first, though presoaking before potting helps to alleviate this somewhat. This initial resistance to water can be helpful to a newly repotted orchid in that it encourages the formation of new roots. Roots damaged in the process of repotting are also more inclined to heal under these drier conditions. Past this preliminary dry phase, bark decomposes within 18 months to 2 years maximum, depending on watering and fertilizing practices (wetter and more fertilizer means shorter bark life. Repotting must occur before major decomposition, as serious root rot is inevitable under the anaerobic conditions more than likely to result. Recently, fir bark quality has suffered because of increasing demands and erratic supplies. Ideally, the bark chips should be hard, fairly thick, and of reasonably uniform grade. This kind of quality hardwood bark will last longer in good condition than one which is softer and more splintery, when in use. Nowadays most growers accept the fact that supplies will be variable in quality, and that some sifting may be necessary to remove the powder, splinters and brittle wood prevalent in today's bark products. Wood chips for outdoor mulching are of even lesser quality, usually containing softwoods such as pine. They should generally be avoided as cheap but inferior substitutes for "orchid barks." Though also in fluctuating supply of late, tree fern has had wide application in orchid growing, both as the major constituent of potting mixes, and in the form of slabs. Like bark, tree fern is available in grades from coarse down to fine. Unlike fir bark, tree fern does not generally require extra nitrogen when used in orchid culture. It is not as woody as bark, though it decomposes at a similar rate. Peat moss has long been a recommended ingredient of terrestrial mixes (see Bertsch, 1980). Yet there is a vast difference between German peat and Canadian, or sphagnum, peat! [Editor's note: If you are unsure f the difference, the peat moss sold in garden centers and mass market outlets is Canadian (Sphagnum) peat. It is finely milled and designed to be added to soil as an amendment to hold water. It is also the basis of most so-called "soilless" mixes in the United States (Coir - or milled coconut fiber is used in Europe] Coarse, chunky German peat, in low proportion to other ingredients such as fir bark, can enhance a mix's water retention while not unduly decreasing its porosity something many terrestrial and semiterrestrial orchids very much appreciate. Sphagnum peat, in contrast, is a fine-grade peat. Even in small amounts it tends to finely disperse, only to rise and coalesce, forming an impervious mat on the surface of the mix. With such a "cap" across its top, a potting mix cannot "breathe" properly. Orchid roots under such anaerobic conditions will languish, as will, consequently, the plant itself. Sadly, sphagnum peat today is more available and less expensive than German peat. German peat in our area is virtually unobtainable. This apparently is the case in many areas, at least at the retail level. Unfortunately sphagnum peat is rarely, if ever, an acceptable alternative in orchid culture! Like other, similar synthetics, Perlite is usually in good supply. A common constituent of potting mixes, it is useful in maintaining good aeration, especially when the coarser grades are used (see illustration, page 1319). Being synthetic and inorganic, perlite does not readily break down. Instead, it discourages "packing" of the decomposing organic components of a mix. All organic mixes tend to settle and become less porous with time and decay. Be forewarned, though, that perlite is notorious for the suffocating cloud of dust it can create in the process of mixing with other ingredients. This can easily be avoided with the addition of water, which it readily absorbs. In addition to being convenient, slotted plastic or clay orchid pots come in a range of sizes and can be matched with media to meet a plant's need for water. Every imaginable container can be used for orchid culture just as long as it can hold both medium and plant - and can drain properly. Growers with a little imagination come up with the most improbable things which fulfill these criteria, but conventional plastic or clay pots are nevertheless the easiest to obtain and use. Logically, the first step in selecting the proper medium is to determine what materials are available at an acceptable price. By the time a beginner's first plants need (often plead!) for repotting, he has located the nearest supply of pots and media. A visit to such a supply will familiarize the beginner with what is at hand, and at what prices. Most garden supply centers in areas with a fair number of orchid growers do carry conventional potting materials needed for orchids. Small bags of potting media, a couple of pots now and then, are all that is needed for the beginning collection of a half-a-dozen plants or so. But this initial stage is all too short-lived, as typically when the "orchid bug" bites, a collection will increase by leaps and bounds in no time whatsoever! By the time this rampant stage is reached, the economics of buying in quantity should be understood. This applies to such products as potting media and pots, as well as fertilizers: the larger the amount or quantity you buy at one time, the lower the per-unit cost. Take advantage of this by purchasing in quantity on your own, or in cooperation with other members of your local society. The savings make it more than worthwhile. By the end of their first year of orchid growing, most beginners are faced with a potpourri of orchids which initially struck their fancy. About this time harsh reality settles in, as some plants do fairly well, while others decidedly do not. Each plant has distinct needs, and for successful growth and flowering these must be accommodated as much as possible. "After the amount of light, I believe that water at the roots, its quality and the length of time it stays there, is the single, most important factor in successful Oncidium culture." (Soule, Lee C., The Culture of Oncidiums, in the April 1981 AOS BULLETIN, page 410). This "wet-to-dry cycle" (time between waterings) which Mr. Soule very properly stresses as so important in Oncidium culture is crucial to all orchids, and is largely determined by the choice of container and potting medium. Oncidiums generally require a one-half- to three-day, wet-to-dry cycle, according to Mr. Soule in the above-quoted article. This is why they frequently do best on slabs or in smaller clay pots containing coarse, porous media. Under typical growing conditions, these tend to dry out quickly. Towards the other extreme, most miltoniopsis, phalaenopsis, paphiopedilums, small seedlings and mericlones prefer fairly constant moisture at their roots, and a long drying period of up to a week. Therefore, media and containers which retain a good deal of water and retard its evaporation (while at the same time maintaining good aeration, of course!) are appropriate for their needs. Plastic pots and finer-grade, absorbent media help achieve this longer period between waterings. Cattleyas and the like are intermediate in this regard, preferring the 4-7 day drying period which most mixes with medium-grade bark tend to follow under typical growing conditions. The accompanying table is meant to be a guideline in choosing appropriate growing media for the various, commonly grown genera. It is just that. 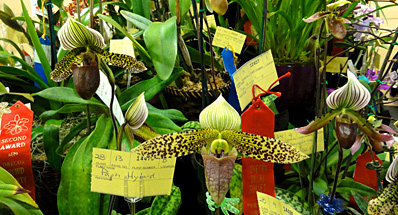 What is not (and cannot be) taken into account is the unique set of growing conditions involved with each cultivated orchid. Naturally, these will have a significant effect on the "wet-to-dry" cycle emphasized here. Whereas conditions of light, temperature, humidity and air movement are essentially predetermined in the initial selection and set-up of the growing area, watering, fertilizing and growing medium selection are completely up to the discretion of the orchid grower. With thoughtful and cautious experimentation, he can adjust these factors in his control to the dictates of those which largely are not, for the ultimate benefit of his orchids. Yet in many instances, varying the growing medium may be the only feasible means of coming up with the proper balance of cultural factors necessary for success. Case 1: A basement, under-lights grower has potted his paphiopedilums in a conventional terrestrial mix - one of the many formulas, usually recommended for greenhouse orchids, containing finer-grade ingredients and peat moss. He notes that the plants take nearly two weeks between waterings under his moderately cool and humid, low-light conditions. Repotting time comes sooner than expected and to his dismay most of the plants have lost their roots. His only realistic option is to resort to a different mix. To his surprise, a conventional cattleya-type mix of medium-grade fir bark and some perlite brings about good root growth and the desired weekly drying cycle. Case 2: A northern hobbyist with a very busy schedule grows his cattleyas indoors in bright windows with a southern exposure. He has all the plants in clay pots containing a coarse-grade bark mix. Unfortunately, by the time he gets around to watering on the weekends, his cattleyas are all bone-dry, particularly during mid-winter cold but sunny periods when the humidifier fights a losing battle with the heater. Some of the smaller plants begin to show signs of desiccation. Rather than shade the windows and possibly lessen flowering, or change his lifestyle to allow for more frequent watering, the grower opts for a change to plastic pots and a finer-grade, more absorbent mix. Subsequently, he is pleased to find his cattleyas usually slightly moist when he is ready to water, and the plants responding favorably. Many alternatives for suitable growing media are open to the orchid grower. Selection should be based on the availability of quality materials, and on the water needs of the orchids involved. These needs can be best met by choosing a medium which, when in use, approximates the drying cycle (length of time between waterings) recommended for the type of orchid grown. Whatever the growing medium used, it must be well aerated for successful orchid culture. — 84 Sherman Street, Cambridge, Massachusetts 02140. Arp, Dr. Gerald K. 1980. Red Lava Rock — A Reasonable Substitute for Fir Bark. Amer. Orchid Soc. Bull. 49(12): 1384-1386. Bertsch, Walter. 1980. Growing Paphiopedilums, A Fine Art: Part 2. Amer. Orchid Soc. Bull. 49 (1): 32-40. Soule, Lee C. 1981. The Culture of Oncidiums. Amer. Orchid Soc. Bull. 50(4): 404-410.